Sir Iain Chalmers in a talk entitled “The scandalous failure of scientists to cumulate scientifically”, he informed the scientific community that rather than looking at any study in isolation, we need to look at the body of evidence. Meta-analysis refers to the statistical synthesis of results from a series of studies. While the statistical procedures can be applied to any set of data, the synthesis will be meaningful only if the studies have been collected systematically. This could be in the context of a systematic review, the process of systematically locating, appraising (and then synthesizing) data from completed studies. Meta-analyses are conducted for a variety of reasons, not only to synthesize evidence on the effects of interventions or to support evidence-based policy or practice. The purpose of the meta-analysis, or more generally, the purpose of any research synthesis has implications for when it should be performed, what model should be used to analyze the data, what sensitivity analyses should be undertaken, and how the results should be interpreted. BMJ publishes a series of journals on Evidence Based medicine, built on the results from systematic reviews. Systematic reviews and meta-analyses are also used to examine the performance of diagnostic tests, epidemiological associations between exposure and disease prevalence, among other topics. 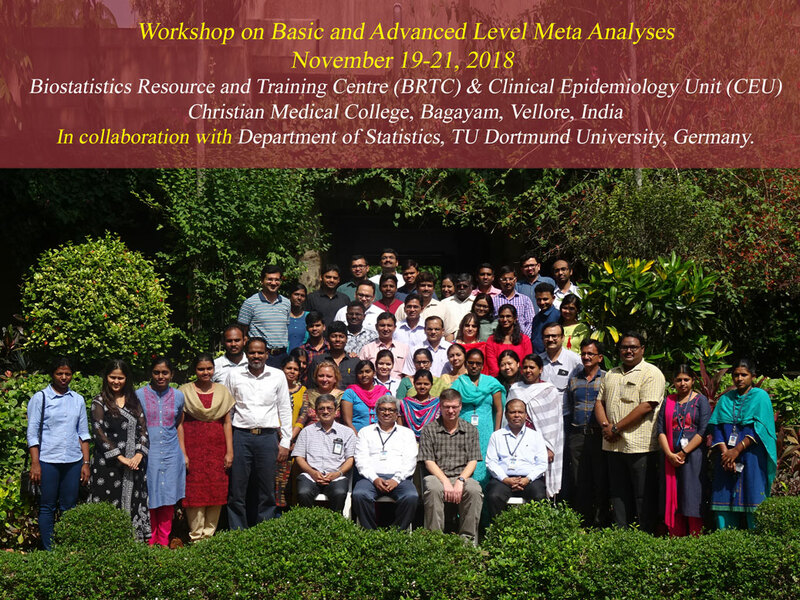 This workshop gives an pportunity to learn and do practical with the help of Prof. Guido Knapp, from the Department of Statistics of TU Dortmund University, Germany and CMC Faculty. understand the need for systematic review and (network) meta-analysis. understand the difference between “fixed effect” and “random effects” meta-analysis model. conduct meta-analysis for normal, binary, and survival outcomes. be aware of possible causes of heterogeneity and methods to test for this. understand how subgroup analyses and meta-regression can be used to explore heterogeneity. conduct multivariate meta-analysis and meta-analysis of diagnostic test accuracy studies. understand the basics of Bayesian meta-analysis. understand what indirect comparisons and network meta-analysis. use R packages for meta-analysis. Course Fee should be paid in full by November 10, 2018. The number of participants for each course is limited to 40 and admission will be purely on first come first served basis. Review of basic statistical meta-analysis: fixed effect and random effects model, DerSimonian-Laird estimator for heterogeneity, funnel plot for publication bias and Egger’s test for publication bias. Basic statistical meta-analysis in R: short introduction in R, introduction of the R packages meta and metafor. Some further basic methods: Restricted Maximum Likelihood and Mandel-Paule estimator for heterogeneity; Hartung-Knapp-Sidik-Jonkman confidence interval for effect size, variations of Egger’s test on publication bias, trim and fill method. Binary data: Mantel-Haenszel and Peto method, conditional and unconditional models for binary data when data are given in 2x2-tables. Meta-regression and subgroup analysis: Explaining heterogeneity by covariates, meta-analysis by factor levels. Multivariate meta-analysis: Combining more than one effect size, use of the R package mvmeta. Meta-analysis of diagnostic test accuracy studies: Combining of sensitivity and specificity, use of the R package mada. Bayesian meta-analysis: General introduction to Bayesian statistics, Bayesian models for meta-analysis of normal outcomes and binary outcomes, choice of prior distributions, use of the R package bayesmeta.